A triumphant celebration of the food and domestic cooking of England plus some recipes from Wales and Scotland. In her introduction Jane Grigson calls us to respect our past: ‘We need to renew and develop the old tradition of Hannah Glasse, Elizabeth Raffald, Maria Rundell and Eliza Acton…. We are always after some new thing. Which is fine in many ways, but in matters of food often disastrous. 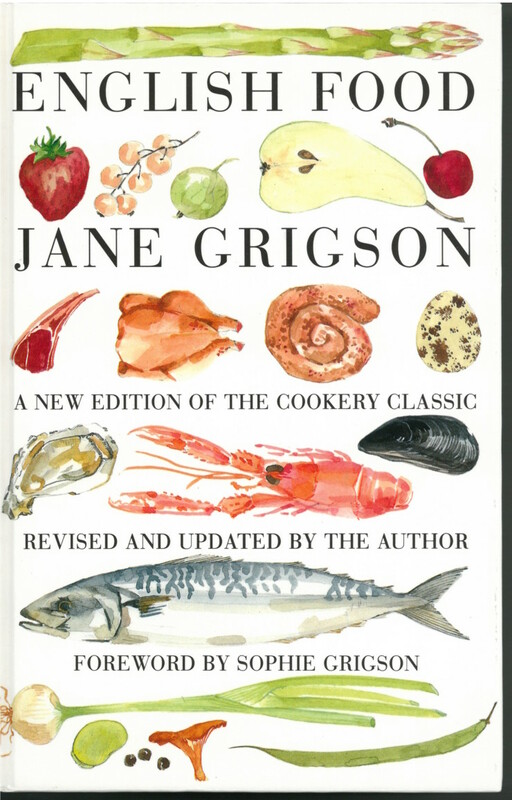 We are so busy running after the latest dish, that the good things we’ve known for centuries are forgotten as quickly as the boring ones.” A revised and updated edition with a foreword by Sophie Grigson appeared following the death of her mother. “English cooking – both historically and in the mouth – is a great deal more varied and delectable than our masochistic temper in this matter allows…. the English cook has a wonderful inheritance if she cares to make use of it….Our classical tradition has been domestic, with the domestic virtues of quiet enjoyment and generosity.